2009 is in the history and a brand new year is within our grab. How soon time has passed, leaving us with wrinkles, oops not, more wisdom I hope and confidence! It's time to delete all the negativity, to copy the brain of the greatest and to paste the happiness of kids on ourselves at this juncture if our 2009 was not as great as we thought and a change of life is expected. However, if you're happy with what you have, keep it up! A change of year is simply a numbering game, no big deal in fact, just do what we should. 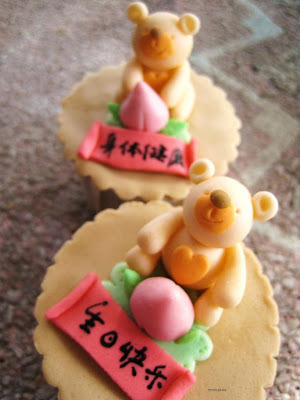 This is part of the cupcakes we made for a mom, the word 生日快乐means happy birthday. 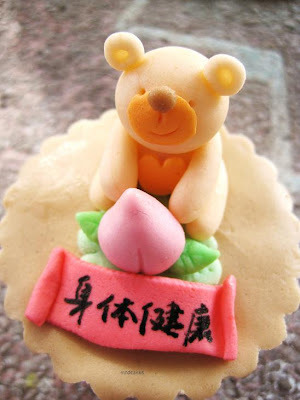 Lovey Bear is holding a peach, for Chinese, peach signifies longevity. Another words are 身体健康，meaning being healthy bodily. Not only upon one's birthday, I guess this is the best wish to anyone at any time. Mom and I shall take this opportunity to wish you a new year blessed with good health, joy and luck! These are so gorgeous, Amy. 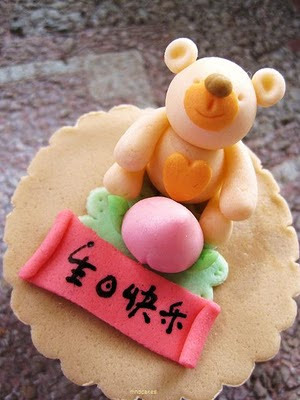 The bears are so adorable, the colors used goes perfectly together, giving it a soft and comfy feeling. Btw, your writing looks perfect. I've never seen it perfectly done like yours. Rylan, I really appreciate your nice comment very much. Thanks. 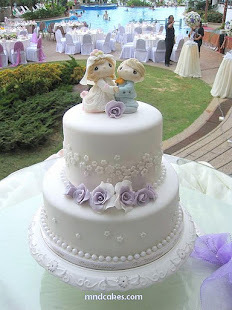 I love Chinese calligraphy and now I've got the chance to practise it on my cakes, hehe...Glad you like it.